We are very proud to announce we have expanded our current product range. As well as offering ISO 27001 certification support we now also offer ISO 9001, ISO 14001, BS OHSAS 18001 certification support. We are also very excited to promote our GAP analysis services and our Virtual Information Security Manager service. Although we have been operating in these fields for sometime now, we are very excited to be adding them to our specialised product range. For more information head over to our Product Range page. So happy to see we now have over 250 #followers. A big thank you to all of our followers for taking an interest in https://t.co/69w8yeLSb8. AWTBS are proud to announce a new partnership with Leighton. As part of this partnership we are now offering two new products. These products are eLearning and Portal development. So who are Leighton? Leighton are a mature digital business that possess a unique blend of experience, reputation and dynamism. Born and bred in the North East they boast 75 employees, based over a Durham, Newcastle and London office that enables them to offer a superior service to their international clients. This makes Leighton the perfect partner in developing the new eLearning and Portal products now on offer. As part of the eLearning product we will undertake a training analysis to find the right content for your company. This is to ensure your eLearning includes everything you need for effective training and development of all employees and users. We will then hand this information to Leighton who will develop an interactive elearning product that is both effective and engaging. The Portal Development is for customers who need a wide range of information in one easily accessible place and is a great way to raise staff engagement. It is also beneficial for information and knowledge transfer between staff members. 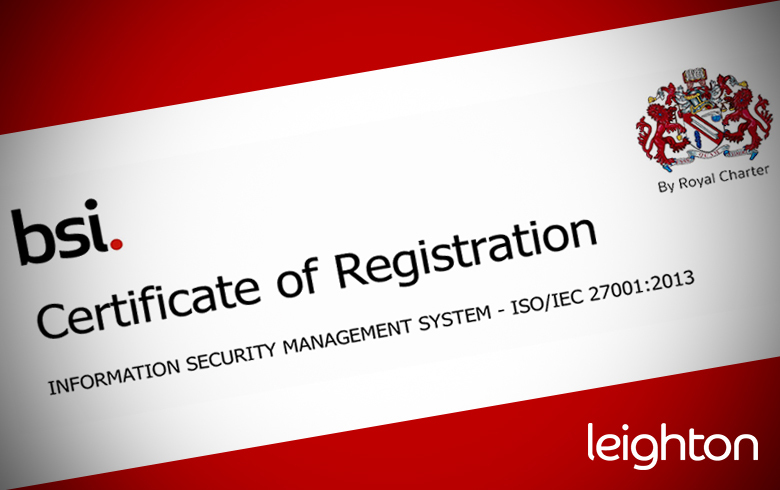 We have recently seen Leighton use this portal tool to create an online Information Security Management System that increased staff engagement and was recognised by BSI as being good practice during a recent ISO 27001 audit. Similar to the eLearning AWTBS will undertake an analysis stage before handing information over to Leighton for development. For more information please visit our Support Services Page or Contact us on info@awtbs.co.uk. AWTBS are now offering a complimentary introductory advisory service for companies who are setting up an Information Security Management System (ISMS). Whether you want your ISMS to be certified with ISO 27001 or you just need your ISMS to protect your organisation, we can help. If you would like to take advantage of this please contact us for more information. The purpose of this complimentary service is to help you determine what your ISMS needs are and what your ISMS objectives should be. By determining this we will be able to confirm your requirements in terms of resource moving forwards to meet these objectives. AWTBS are proud to announce our latest client to achieve ISO 27001 Information Security Certification. This company is Leighton who deliver end to end digital transformation services that empower some of the world’s biggest brands to communicate and interact better with customers via their digital assets. To celebrate 15 years of trading we are now offering 1 day of ISO 27001 Consultancy absolutely FREE. What is the catch you are asking? Quite simply there isn’t one. A day of ISO 27001 consultancy absolutely FREE. For further information please contact us with your ISO 27001 consultancy needs. Terms and Conditions: Consultancy is limited to AWTBS portfolio and will be delivered at a venue supplied by the client, limited availability based on first come first served, and AWTBS reserve the right to end this promotion at any point without notice. AWTBS are very proud to announce that we are now a member of the BSI Associate Consultant Programme (ACP). As a member of BSI’s Associate Consultant Programme (ACP) we can support you throughout implementation as you work towards certification – sharing our knowledge of regulatory requirements and showing you how to stay resilient and responsive. Our clients know that bringing standards to their business has many benefits as well as getting ahead of the competition. Being independently assessed and certified gives credibility and helps attract new customers.